Riverside Paper Co has thousands of bag sizes available. Our Flat Poly bags are available in 1 mil - 6 mil. 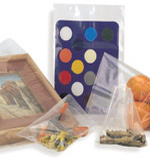 Riverside can custom make poly bags to your specific requirements. We can custom print up to 6 colors. Please call us for your custom print and custom sized poly bags.